Powered by a dependable 43cc 2-stroke, single cylinder, air cooled engine. Fully automatic transmission and electric start makes the handling more easier and comfortable. Its hand brake , assure this ATV's safety and dependability. This kids' ATV lightweight and low maintenance make it perfect for casual yard, field, and trail destruction. 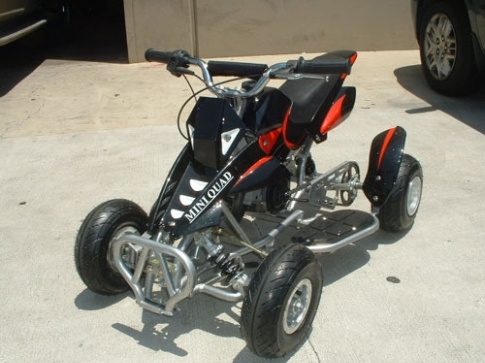 It will be safe along with the right size for growth.This high quality ATV will give an ABUNDANCE OF FUN & MEMORIES! Transmission: Fully Automatic Single Gear = Easy Rider! Assembly: This item comes 85% assembled. Some simple assembly required. Be sure to tighten all screws and check for appropriate levels of engine fluid prior to operation. Install tires, battery and handlebars. The electric starting system on the 43cc Sport ATV makes this 4 wheeler user-friendly. This electric starting system makes it simple to use in any condition. This Prowler quad has an automatic transmission! That makes this ATV easy to maneuver and ride. This quad model has the 43cc Sport ATV 2-Stroke Engine which provides simplicity and power. Coolster 43cc ATVs have an air-cooled engine designed to prevent overheating. There will be no worries about overheating or extra engine maintenance with this quad. This ATV features hydraulic disc brake on the rear giving it that extra advantage of being able to stop quicker and more effectively. This ATV comes with independent gas shock suspension on the front. This allows you to keep the ride as smooth and as safe as possible. Remember that by purchasing an ATV online, you are responsible for performing the setup that a dealer would normally perform - such as putting on tires, hooking up the battery, checking tightness of all nuts and bolts, changing oil, etc. Occasionally some units may need other routine items checked/adjusted such as adjusting the carburetor idle and mixture screws, checking to ensure wires are well connected, adjusting chain slack and alignment, if needed. While we will gladly assist you with any technical questions. We have prepared assistance for you to help properly maintain your new purchase!